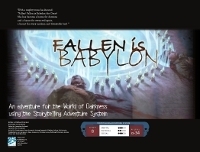 Fallen is Babylon, a New World of Darkness SAS! A man who makes a deal with a demon is inviting that sin into him. It does more than consume him – it defines him. It wears him. It rots away at the core of his being. Demons can do it to places, too – whole cities, given the chance. They can alter the supernatural landscape. Here, then, is the result of sin, hubris and impatience, and here is a chance to banish a demon back to Hell and right a great wrong – or to seize power. Which will the characters choose? Fallen is Babylon is a story for the World of Darkness inspired by and using systems and material from World of Darkness: Inferno. While having this book would be very helpful in running Fallen is Babylon, it isn’t strictly necessary, as the relevant systems are reprinted. Fallen is Babylon is available now at the Flames Rising RPGNow Shop.